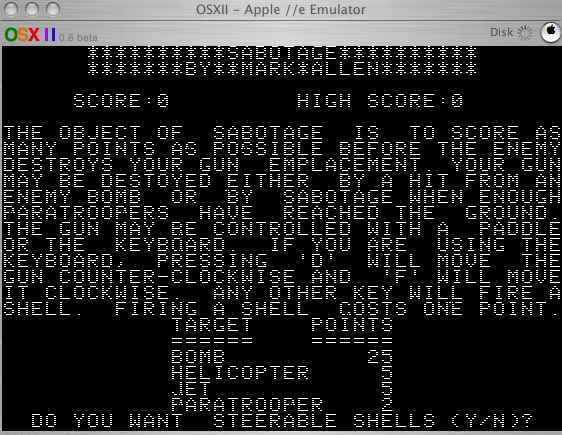 To the person who arrived at my site googling for “apple II games remake download old parachute”: The name of the game you’re looking for is “Sabotage,” and you can get it here. 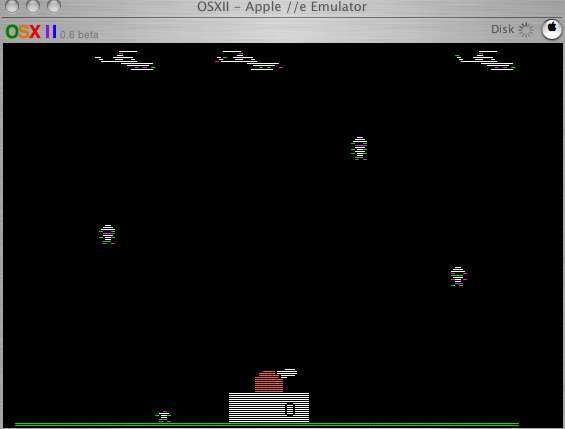 It should play in any halfway decent Apple II emulator. I liked Sabotage. It was one of my default “pick up” games that you could always rely on when you wanted something quick and fun. It was a diverting little game, with a surprising amount of tactical trade off. You could shoot the paratroopers full on, blowing them into bits, or you could take them out by shooting the helicopters, whose shrapnel would cut them to pieces, or you could aim carefully, shoot out their parachutes and watch them plummet. If you were accurate enough, you could even make a paratrooper plummet and squash a trooper who had already landed safely. If three or four paratroopers managed to land safely on one side of your gun emplacement or the other, they would team up and blow you up, ending the game.